Tualatin Valley Water District’s (TVWD) Ridgewood View Park Reservoir and Pump Station recently received the Institute for Sustainable Infrastructure’s (ISI) Envision rating system’s Gold Award. In partnership with Tualatin Hills Park and Recreation District (THPRD), the Ridgewood View Park project is the first joint water storage reservoir and park facility to receive an ISI Envision award, and is also the first Envision award for Oregon. In addition, it is the 11th project in North America to be recognized by the Envision rating system. The multi-disciplinary nature of the Ridgewood View Park project allowed for creativity in the sustainable design. The project included the demolition of an existing 5 million gallon (MG) reservoir, the design and construction of a new 8 MG reservoir, an 11 MG per day pump station, as well as 6,700 feet of new water pipelines and extensive improvements to Ridgewood View Park, located in the West Slope neighborhood of Washington County. 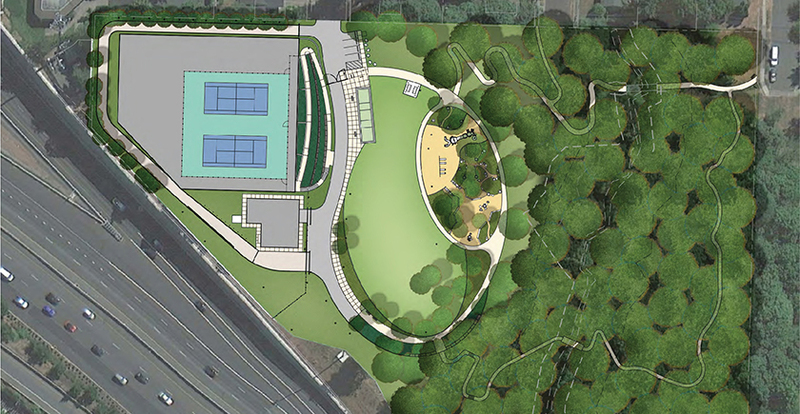 Park upgrades include new tennis court facilities, a bocce ball court, a nature-themed play area, landscaping and additional walking trails, and site pedestrian connections. Scheduled to be completed in the summer of 2016, the Ridgewood View Park project will help improve water reliability and community recreation in the West Hills area. Project planning started in 2012 with the design firm, AECOM, and construction began in 2014. “The Ridgewood View Park project is crucial to the reliability of the water system, and has definitely been a combined effort between the community and multiple agencies from the outset. It is very gratifying to receive independent verification that this project represents a best practice in sustainable design,” said TVWD’s Ridgewood View Project Manager and Engineer, Nick Augustus. “One of TVWD’s core values is environmental and community stewardship. The design and construction of a project of this magnitude requires public input, and we have been pleased to work with the community in a collaborative way,” he added. Natural World: The project rated highly for meeting multiple Natural World criteria, including reducing the hauling and disposal of materials, reusing the concrete from the old reservoir as backfill, limiting the amount of excavation required, incorporating excavated boulders in the landscaping, using only native plants, and providing storm water treatment through bio-swales. Quality of Life: The project thrived in the Quality of Life category due to the development of the project through a partnership with Tualatin Hills Parks and Recreation District, the neighborhood and the community. A robust stakeholder engagement program was established during the design process to ensure that the finished project reflected community needs and priorities. Leadership: The project scored well in the Leadership category for effective leadership and commitment, strong public outreach, communication and teamwork. An ISI-Envision award ceremony and grand opening celebration with the community will take place at the new Ridgewood View Park in summer 2016.